Hebburn crashed out of the FA Vase with a disappointing 2-0 defeat against West Auckland yesterday. A Jack Donaghy own goal put the visitors in front early in the first half before Amar Purewal’s second half goal doubled their lead and secured the victory. The rearranged game was played in blustery conditions at The Energy Check Sports Ground and West Auckland got the better of them. Hebburn started the game fairly well and came close nine minutes in when Robbie Spence’s long-range effort was pushed wide and Luke Sullivan’s rebound went straight at the keeper. Just nine minutes later, West Auckland had the lead when Adam Burnicle’s cross was miss-hit by Donaghy into his own net. The visitors almost doubled their lead when Purewal’s diving header from a corner went just wide in the 21st minute and then 12 minutes later Burnicle’s free header following a good ball on the left went over the bar. It took West only seven minutes into the second half to extend their lead when David Dowson played through Purewal who made a great run beating two before burying the ball past Andrew Jennison in the bottom-left corner. Seven minutes later, Burnicle’s effort went straight at Jennison following a poorly defended corner. 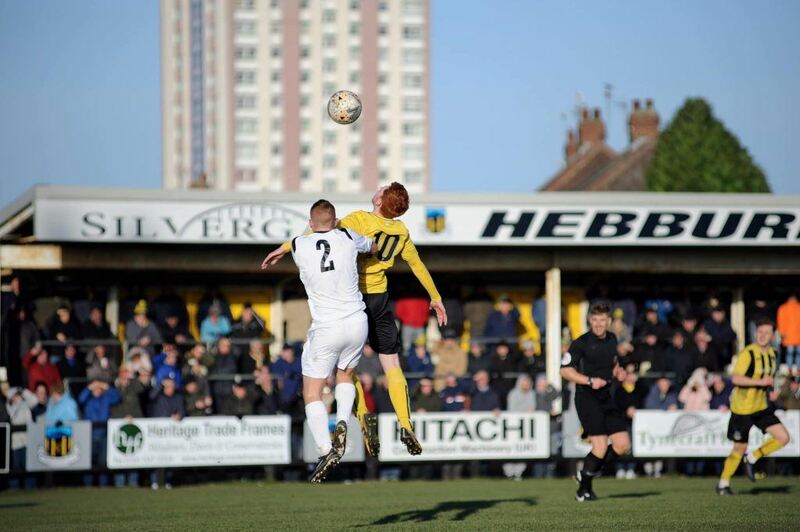 Hebburn came close through Michael Richardson in the 77th minute when his long-range free kick was tipped over, and then in added time captain Louis Storey’s effort on the edge of the box was pushed wide by Shane Bland. West Auckland nearly settled proceedings in the fourth minute of added time through Dowson following good work on the left by Purewal and Lewis Dodds but his strike was pushed wide by Jennison. West Auckland will face Chertsey at home in the quarter final in two weeks time. Hebburn Town: Jennison, Gilhespy, Storey (capt), Donaghy (Chow 56), Shaw, Dibb-Fuller (Smith 72), Stephenson, Spence, Sullivan (Robson 65), Richardson, Armstrong. West Auckland: Bland, Hegarty, Hunter, Colquhoun, Price, Francis, Portas, Dodds, Purewal, Burnicle, Dowson. Subs not used: Morris, Cobain, Connor, Heaney, Coulson.